I received a resume (a PDF) via email. 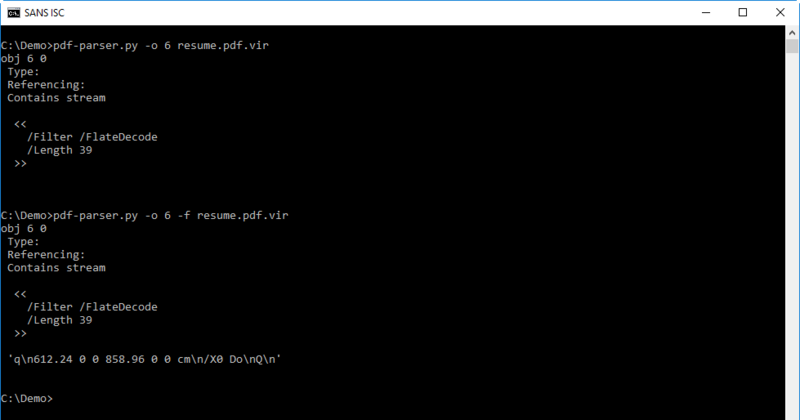 It was not malicious, it was a real resume, and it's a good opportunity to show how to determine if a PDF contains nothing malicious. The PDF has not a lot of objects (7) neither streams (2). 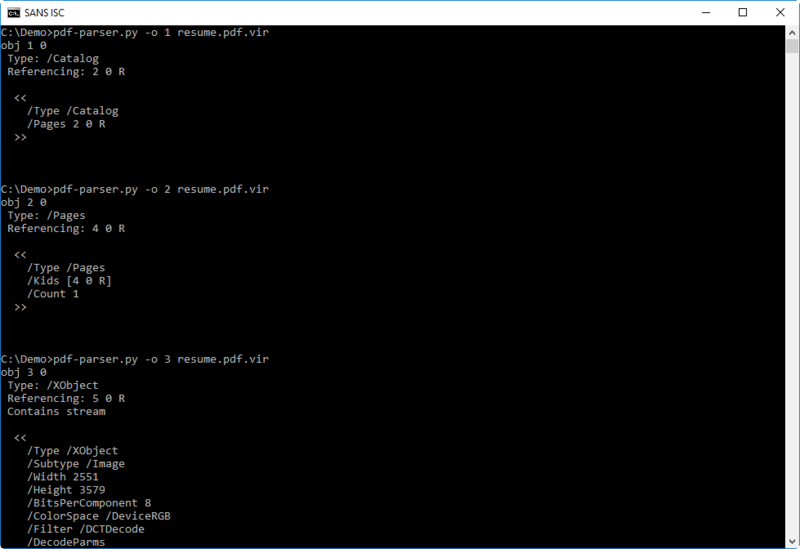 And there's no other warning from pdfid.py. That doesn't mean the pdf is not malicious, it could still contain an exploit for a (un)known vulnerability. This info helps to determine if there is something hiding in this PDF outside the normal objects. There's just one end-of-file marker (%%EOF), and there are no more bytes following that marker, so nothing was appended to this PDF. 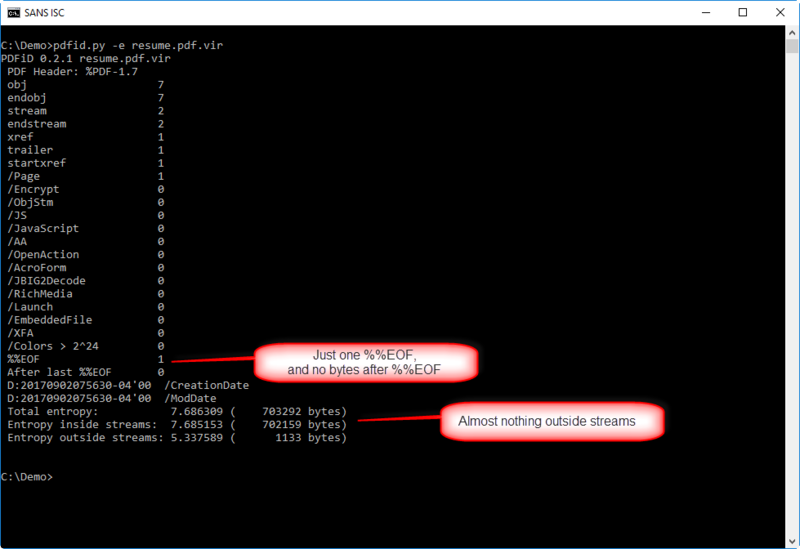 And there are very few bytes outside streams (1133), so it's unlikely something was hidden there. Lately, we've seen several PDFs campaings with just a URL in the document pointing to malware. So this PDF has a lot of indications that it is not malicious. PDF with objects like these are usually just a document with an image like a JPEG (object XObject) inside it. So there is not malicious to find. The only remaining place where something could be hiding, is in the streams of objects 3 and 6. 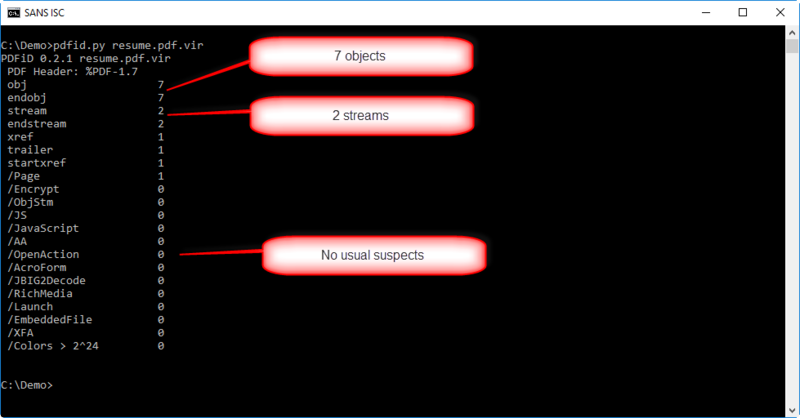 You will probably not recognize the code in the decompressed stream, but this isa description of a page (defining it's size and displaying an image). So nothing malicious here. What remains, is the image in object 3. There could be an exploit hiding in there, and in part 2, we will see if we can find one.